REL 104. Introduction to Religious Studies. 3 Hours. 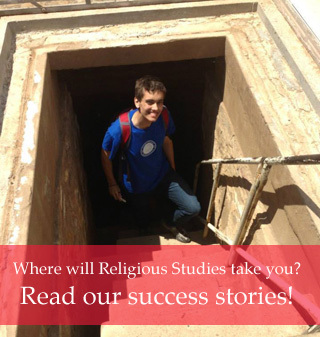 HR AE42/GE3H / H.
This course introduces students to the academic study of religions. It acquaints students with key methods and issues in religious studies, and provides an introductory survey of selected religions. Not open to students who have taken REL 105. LEC. TR 11am - 12:15pm. Mallot 2048. Instructor: Sandra Zimdars-Swartz. REL 106. Living Religions of the East. 3 Hours. HR/NW AE42/GE3H / H/W. A basic introduction to religion in India, China, and Japan with emphasis upon religions that affect the modern period. Not open to students who have taken REL 108/EALC 108. (Same as EALC 105.) LEC. MWF 10-10:50am. Smith 100. Instructor: William Lindsey. REL 107. Living Religions of the West. 3 Hours. HR AE42/GE3H / H.
A basic introduction to the major religious traditions of the Near East, Europe, and the Americas, with an emphasis on their development through the modern period and their expressions in contemporary life. Not open to students who have taken REL 109. (Same as JWSH 107.) LEC. MW 12:30-1:45pm. Smith 100. Instructor: Joshua Lollar. REL 124. Understanding the Bible. 3 Hours. HR AE42/GE3H / H.
An introduction to the literature of the Bible, exploring the relationships among the various types of literature present and the function of each type in the history and religious life of the people who produced and used them. Cannot be taken concurrently with REL 311 or JWSH 321 or REL 315. Not open to students who have taken REL 125 or JWSH 125. (Same as JWSH 124.) LEC. MW 11-11:50am. Smith 100. Instructor: Paul Mirecki. REL 171. Religion in American Society. 3 Hours. HR AE41/GE3H / H.
A broad introduction to religion in American culture. This class emphasizes the well-established religions with large followings (viz. Judaism, Catholicism, Eastern Orthodoxy, and Protestantism). Some attention is also given to other religions active in America. Other topics covered include the relationship of church and state, religion in ethnic and racial minority groups, and women and religion. Not open to students who have taken REL 172. (Same as AMS 290.) LEC. TR 11am-12:15pm. Smith 100. Instructor: Timothy Miller. REL 177. First Year Seminar: Apocalypse!. 3 Hours. GE11 / U. This seminar focuses on the roots of continuing interest in the end of the world. We will examine the ancient texts that first express apocalyptic ideas, and consider the development of these ideas over time. We will also look at their ongoing impact, and consider why they have proven so compelling to so many in the modern world. Prerequisite: First-time freshman status. LEC. TR 1-2:15pm. Smith 208. Instructor: Molly Zahn. REL 325. Introduction to Judaism. 3 Hours. H.
Analyzes a selection of the core texts, teachings, and practices of Jewish religious traditions in terms of classical and contemporary understanding. (Same as JWSH 325.) LEC. TR 1-2:15pm. Smith 206. Instructor: Neil Schuster. REL 341. Mysticism. 3 Hours. H.
The nature of mystical experience and reflection as expressed in selected mystical literature of the world's religions. LEC. TR 11-12:15pm. Smith 107. Instructor: Paul Zimdars-Swartz. REL 350. Islam. 3 Hours. NW AE42/GE3H / H/W. Origins of Islam; the Prophet Muhammad; the Holy Koran; religious symbols and moral mandates; historical developments. (Same as AAAS 349.) LEC. REL 371. Religion and Society in Tension. 3 Hours. H.
Specific issues of conflict between the values of certain religious groups and those of the larger society. Includes problems of church and state, birth control and abortion, civil disobedience and dissent, education, war and peace, and "civil religion. LEC. TR 2:30-3:45pm. Smith 206. Instructor: Andrew Morgan. REL 404. Undergraduate Seminar in Religion: Evangelicals in America. 3 Hours. H.
Topic, instructor, prerequisite and hours of credit to be announced in Schedule of Classes. Particular subject matter any given semester responding to student interest and taking advantage of special faculty competence. Class discussion, readings, and individual projects. LEC. W 7-9:30pm. Smith 107. Instructor: Aaron Ketchell. REL 502. Special Topics in Religion: Sacred Feminine in Korea and Japan. 3 Hours. H.
This course focuses on women as activists, thinkers, practitioners, and critics in the shaping of religion in modern Korea and Japan (late 19th-21st centuries). As a focusing lens, attention to female actors produces a very different and, frankly, more interesting and intersectional view of religion in Korea and Japan than do traditional, culture-specific, largely male-centric surveys. Using a comparative approach dialoguing between both cultures, the primary foci of the course are: i) early female missionary Christianity and its intersections with race, gender, women’s rights, and temperance, ii) religious underpinnings of/responses to the early 20th century Japanese New Woman movement and its Korean cousin, iii) female Buddhist thinkers/practitioners in both countries, including resident foreigners, iv) feminist Christian theologians in both countries, v) feminist critiques of Confucianism, Buddhism, and Christianity.Prerequisite: Consent of instructor. LEC. MWF 12-12:50pm. Smith 107. Instructor: William Lindsey. REL 515. Studies in Early Christian Literature and History. 3 Hours. H.
Contemporary research in the history and literature of earliest Christianity including most of the following: (1) the use of critical method, (2) philosophical and theological contexts, (3) sociological analyses, (4) interpretation of archeological data (5) papyrology and the medieval manuscript tradition, (6) relations between Christians and the Roman government, (7) relations between Christians and Jews, (8) development of diverse literary genres, and (9) the origins of gnosis and Christian gnosticism. Prerequisite: REL 124 or permission of instructor. LEC. MW 12:30-1:45pm. Smith 206. Instructor: Paul Mirecki. REL 601. Approaches to the Study of Religion. 3 Hours. H.
An introduction to the various methods by which social scientists, historians, philosophers, and theologians study the meaning, influence, and significance of religion as an integral part of society and its cultural heritage. Prerequisite: REL 104 required for undergraduate students. No prerequisite for graduate students. LEC. W 2-4:30pm. Smith 208. Instructor: Jackie Brinton. REL 671. American Communes. 3 Hours. H.
An examination of utopian communities in North America from the seventeenth century to the present. The course will survey the history, literature, and social dynamics of representative communal societies and movements including the Shakers, the Hutterites, the Oneida Community, Catholic religious communities, egalitarian communities, and other religious and secular communities. LEC. TR 2:30-3:45pm. Smith 107. Instructor: Timothy Miller. REL 727. Seminar in Religion, Text and Textuality. 3 Hours. This seminar will focus on the issue of “scripture” and “interpretation” as meaningful categories across a variety of religious traditions and in the academic study of religion. We will consider the questions of how “scripture” might be defined in various contexts, what unifies the many different types of texts that have been given this label, and how scripture functions in different religious, historical, and geographical settings. We will also examine the complex relationship between scripture and interpretation, with special attention to how sacred/authoritative texts are continually renewed and recast through interpretation, and to how interpretation itself becomes authoritative. SEM. T 9-11:30am. Smith 208. Instructor: Molly Zahn.